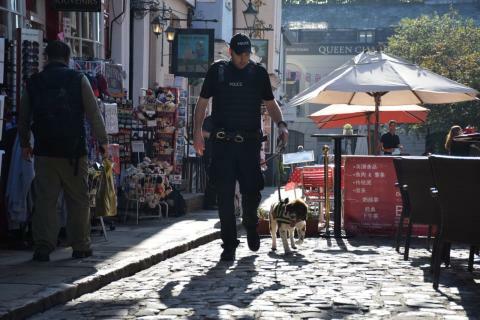 Specialist search units have been carrying out activity in Windsor in the lead up to the Royal Wedding of Her Royal Highness Princess Eugenie of York and Mr Jack Brooksbank in Windsor on Friday (12/10). This activity is part of the wider police operation to make the event safe and secure. Members of the public will also see an increased presence of armed and non-armed officers, and will be using a variety of visible and non-visible security measures. Joint Operations Police Search Co-ordinator, Sergeant James Wilkinson, said: “Our search units have been carrying out activity over a number of different locations throughout Windsor including in the town centre, the Great Park and on the Long Walk. “We will continue to carry out activity in the lead up and during the wedding, and the public may see overt activities including searching of the town centre and our police search dog team. “We will also be carrying out covert searches that the public may not see. You can find further information about the policing of the Royal Wedding in our digital media pack.